Charles Saatchi, Donny Deutsch: name any flog-master you care to. In my opinion they’re second best, though, compared to the holy ones, those who bedeck Williamsburg’s streets with the word of G-d. Suddenly last summer, out for a bike jaunt, my mind did a double take as I stopped to answer a cell-phone call. Plastered on a wall of one of the many Satmar institutions in Williamsburg, the fires of hell jumped out, licking at my heels. Was I in Brooklyn? Not. On a Yiddish broadside, Sodom and Gomorrah burned in front of my eyes. Orthodox Jews (and many short of that) wear a Khamsa around their necks, the five-fingered hand, an amulet of protection from the evil surrounding us. Palms come in many forms, though, or so I learned, as I finished my chat and read the bill. Gvalld screams the poster: the ultimate warning: beware, yikes, oy vey to the max. 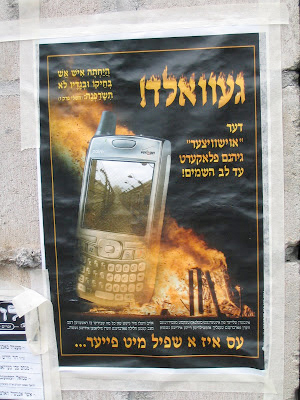 Gehenem flakert ad leyb ha shamayim: “The fires of hell are blazing into the heart of the heavens.” Hollywood’s best could do no more: the Khamsa’s evil twin is a Verizon Palm Treo. Going things one better is an adman’s goal; the ultra-orthodox advocates know no bounds. Not only do flames erupt from the typescript; not only is the Palm engulfed in a pillar of fire. There on a screen of innocent plasma, a picture too grim to imagine shines forth. Rows of barbed wire and death-barracks doors tell us forthwith from whence we text. Der Auschwitzer merges man and machine. Use it and know: you’re a Sonderkommando on speakerphone. Circles and circles of false protection. Avert your gaze and your soul will stay pure. The pious and I are different in thinking. I think they’re self-blinded. They think I’m treyf. The magical device of shielding one’s eyes, does little, I think, to balance one’s life. The deep-seated belief in magical devices, reminds me of Jesus perched up on that cross. True belief consists in its very own absence, the doubt He exists or can do spit for anyone. No gun and no cell phone can fix what’s the problem. Phyllo-layered, like arm-wrapped tefillin, the layers of rules keep one dozing through life. In the upper right corner of this screed against deviltry sits the authority for what’s shown below: Hayakhteh ish eysh b’kheyko, u’bgodov lo tisarafnah? A beautiful Hebrew verse from Proverbs is twisted to fit their devices: “Would a man rake coals into his bosom and his clothes not catch fire?” But Qwerty is blameless. Ring tones are just sounds. Pushing oneself away from the table of evil consists not in mere physical choice. It’s there in the realm of one’s inchoate struggle: there will you find Him, if He’s to be found. Still, standing still, I admire the pious ones. On average a purer and better type folk. Life was just fine without all these gadgets. Our time to reflect has been stolen by default. Better I think, though, to try some hot raking, to smell the stench of one’s wool gone asmoke. Each to his own, sure. But doing the choosing renders one chosen. If not, one’s decision is just one palmed off.